Light, airy luxury home on deep-water canal with private boat ramp and dock! Painted throughout in fall of 2017. Beautiful hardwood floors in main living areas, granite countertops, spacious well equipped gourmet kitchen, outdoor solar lighting, and a double hammock for relaxing by the water. With 2 separate wings upstairs that overlook the living area, it is ideal for 2 families to share. Each wing has 2 bedrooms and a full bath. Both waterfront master bedrooms, one queen and one king, have private decks overlooking the water. The 2nd bedrooms in each wing have 2 twins each. The main living area has soaring cathedral ceilings, many windows, lots of light, wood-burning fireplace, wet bar, game table, and an additional half bath. There is a delightful screened porch, outside shower, large separate laundry room, and nicely landscaped back yard with picnic table for enjoying meals by the water and adirondack chairs for relaxing watching the boats go by enjoying the spectacular sunsets. Shops and restaurants are just a short walk away (Grotto Pizza, McCabes Gourmet Market where your pets can join you as you sip your morning coffee), the tackle shop to outfit you for fishing, and other unique shops. The beach is a leisurely 10 minute (or a brisk 5 minute), walk from the house. Should you prefer to bike, bike racks are available at the beach, and a parking pass is provided for those preferring to drive. Although Bethany Beach does not allow dogs in season, the State park is adjacent to the beach (just steps away) where they are welcome anytime as long as they are under control. The house has ample off-street parking for 4+ cars in addition to your boat(s). Bring your boat, and tie it up at local restaurants for dinner! A great house for entertaining, with areas equipped for indoor dining in house or on screened porch & outdoor dining on deck or on large picnic table by water. The house is especially great for entertaining, with its full wet bar, large gourmet kitchen, fireplace, screened porch, 3 decks, and lovely landscaped yard. It's also great for relaxing and watching the spectacular Bethany sunsets. Situated on a quiet street, the home is a short 2.5-block walk (10 minutes at a leisurely pace, or 5 minutes at a brisk pace)to the beach; however, a beach parking pass is included if you prefer to drive. Restaurants and shopping are also nearby. Well behaved pets on prescription flea control medication considered. Home is at the border of the state park, where dogs on leach are allowed on the beach. After October, they are also allowed on the beach in Bethany. Don't leave beloved family members behind! Owner and her dogs enjoying the beach at nearby (walk-to from house) Fenwick Island State Park. Our main requirement was the boat ramp. Love to be on the water and explore the back bays by boat, cruise to local restaurants and tie up for lunch/dinner, watch the sunsets from the decks and watch the ducks that frequent the canal. All this, plus just a short walk to the beach. A second key reason is the proximity to the state park (just to the South) where we can enjoy the beach with our dogs. The third reason was the quiet location at the southern edge of Bethany --- away from it all, yet still very close. Great for the dogs! Walk to state park where they are allowed 24 hours a day. Walk to McCabe's Gourmet Market for morning coffee and breakfast --- patio is dog friendly and they always come with us! Watching the ducks swim by from the decks or screened porch is a favorite pastime of mine, and boating/kayaking in the canals and bay is great. The 2 full baths have both tub and shower. The upstairs has 2 wings joined by a walkway. Each wing has one waterfront bedroom with either king or queen, a bedroom with 2 twin beds, and one of the 2 full baths. The ground floor bath is a half bath off the living area. The house is situated on a deepwater canal and has a boat ramp and boat dock. Many of our guests have rented kayaks for the week from Coastal Kayak. 3-zone heating and air : 1 system for downstairs and a separate one for each upstairs wing --- allows different cooling levels for varied preferences. Large capacity multi-cycle. In separate ground floor laundry room. In separate ground floor laundry room. Full size frost free refrigerator. Does not have automatic ice maker. Electric with 2 large and 2 small burners. Over the stove built in. Shelved separate pantry. Plenty of space!! Full service for 12 plus extra dishes and glassware. Many popular titles for both adults and kids. (2) Private to the 2 waterfront bedrooms. 3 spacious decks overlooking water --- watch the ducks & boaterss go by. Spectacular sunsets. Well-behaved pets on prescription flea control medication accepted with $200 non-refundable pet fee. This is a perfect and quiet location. The canal view is beautiful, the house is ideal, and both Bethany and Fenwick/OC are a driveable distance. I'd definitely bring the family here again. Spacious home, good condition, and allows pets. Owner very nice to work with. For you walkers, getting to the beach, no problem. For those of you who like the ocean real close by, you might be a tad disappointed. To me, walking to the beach felt like a good trek. I would compare it to a 4 block walk, and that includes crossing a 4 lane highway. (No real problem there cause there is a traffic signal there that makes crossings easy.) The house has a good location. 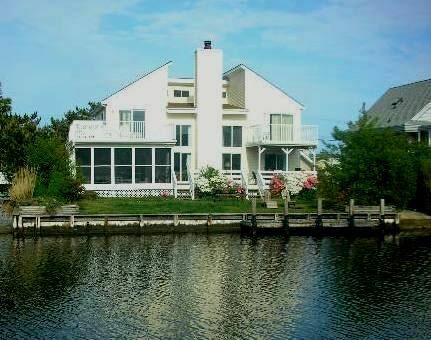 You are close to Bethany Beach, Ocean City, Fenwick Island, and lots of attractions. But, you will have to drive to them. I would recommend this house just on my dealings with the owner of this home, alone. She was absolutely lovely and really had our (the guests) best interests at heart. The house was lovely. We did have a small problem with figuring out the TV. There was no list of channels but we ended up getting it figured out. We had a great week in South Bethany Beach, DE! The house is certainly large enough. We had two families with a total of 7 adults. We also brought along our dog which was a plus. While the house was indeed roomy, the only complaint I would have was that it needed some updating. There were many areas where the paint was peeling and some of the furniture was a bit uncomfortable. When I saw this rental on the internet I thought it was beautiful. When we arrived I was a bit disappointed. I looked at the rental on my phone while we were there and realized that the photos were from 2009! We do have a boat so the location was wonderful! We did enjoy sitting outside on the adirondack chairs and enjoyed views of the lagoon. We had a fantastic time at the south bethany beach house. The house was clean and the owner was very responsive to our few questions upon arrival. The house is located very close to the beach - definitely walkable, but there is also a pass to park right next to the beach if you have a ton of stuff. There is an adorable market just a couple of blocks away that has essentials, coffee, and delicious sandwiches. It was great that we could bring our dogs with too! We will definitely stay again if we return to Bethany! Very much enjoyed our stay, property was clean and has wonderful amenities along with walking distance to the beach. We had a very nice family vacation and including our family dog was a treat. Boating and Crabbing right off your own dock. Kayak, pontoon boat, other boat rentals nearby.